Adequate protein ingestion is essential for maximizing training-induced adaptations, particularly in strength development. Bone contains almost 60% of the magnesium in the body. Within the past few years, beta-alanine has appeared on the sport nutrition market. Among studies on the various aspects of nutrient timing, postexercise investigations constitute an overwhelming majority of the scientific literature. 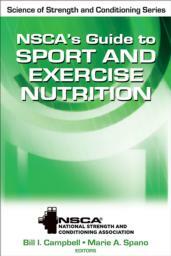 NSCA’s Guide to Sport and Exercise Nutrition will lead you through the key concepts of sport and exercise nutrition so that you can assess an individual’s nutrition status and—if it falls within your scope of practice—develop customized nutrition plans. A reference for current NSCA members and those preparing for an NSCA certification exam; a valuable resource for any fitness or nutrition professional, including strength and conditioning professionals, personal trainers, and sport dietitians. Campbell is a member of the National Strength and Conditioning Association (NSCA), the American College of Sports Medicine (ACSM), and the International Society of Sports Nutrition (ISSN). Campbell is also a fellow of ISSN and serves on the organization’s advisory board. He received his PhD in exercise, nutrition, and preventive health from Baylor University in 2007. During this same year, he also received the Outstanding Doctoral Student Award for research and teaching. In 2009, Campbell received the Outstanding Undergraduate Teaching Award from the University of South Florida.